Landscape oil paint and watercolors to print on canvas or paper prints. 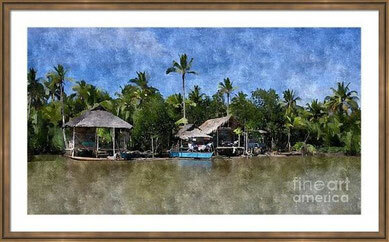 Simple life on a River, oil paint. I carefully give an oil paint effect of this landscape photo, that i took during my travel in the south Mindanao (one of the 7107 islands in the philippines). The effect of the oil painting was added with some silk effect to get a more personalised brush alike on the vegetation and the hutt. 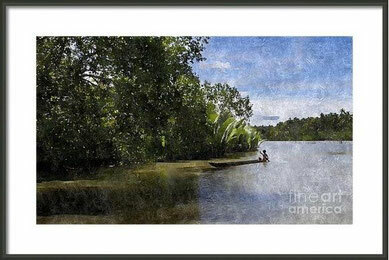 Photo that i took in south of Mindanao in the Philippines, we was on a speedboat to visit the jungle by the river, when after a turn i saw this kid padding on his canoe alone going down the river. I gave an oil painting effect to this picture because the exotic canoe with this naked kid padding was out of time for me, which is reinforced by the oil paint effect.